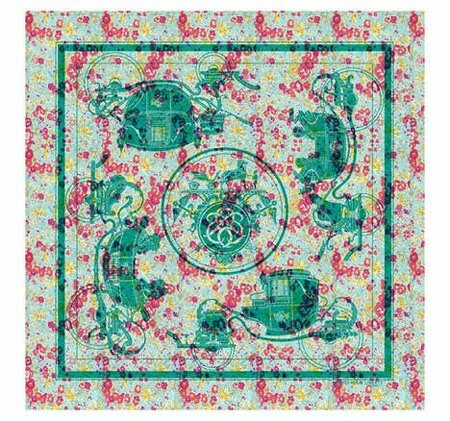 An artist long admired for his intimate knowledge and unique ability to depict horses, bulls and (hunting) dogs (and a personal favourite of mine as well), Hubert de Watrigant has enchanted me again with yet another design. 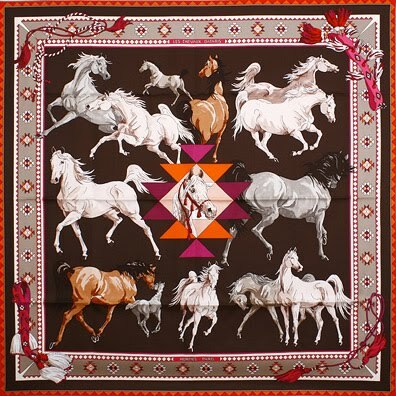 “Les Chavaux Qataris” (“the Qatar Horses”) is a tribute to the majestic breed of the Arabian Horse, whose distinctive head shape and high tail carriage commend so much respect and love from horse lovers and connoisseurs alike. What you come to recognize is the particular dynamism of this design, due to the depiction of the horses as running freely across the folds of the scarf. 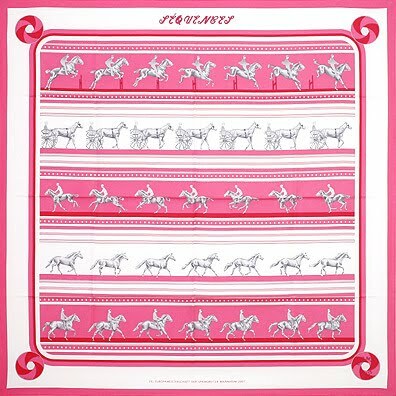 The renditions in the corners make me think of Native Indian artifacts - which may or may not be the case, although I did recognize, in the patterns along the edges, typical Argentinian belt patterns. 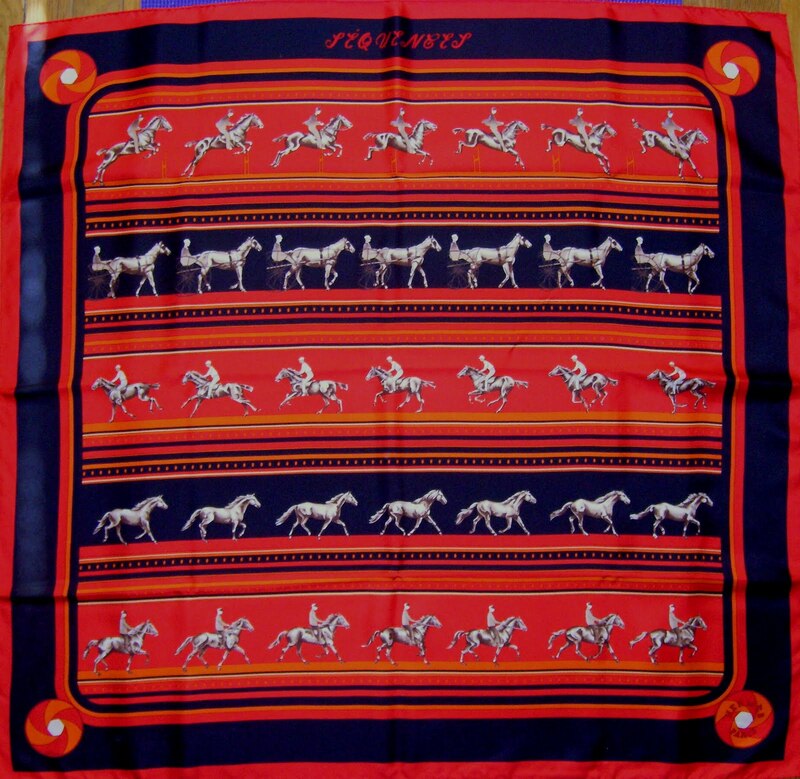 Perhaps designed as such on purpose, the horses at the bottom of the design are facing inward, whereas those in the upper corners are facing out - so as perhaps to inspire the admirers to look for more horses than the two heads seen in the corners, when the scarf is tied. 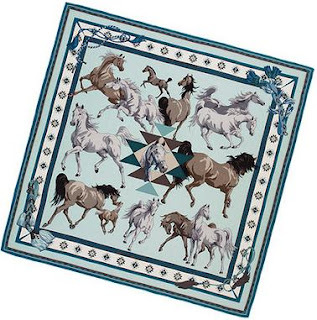 I would have preferred to see all corner horses face outward, because the allure of their heads is so fantastic. 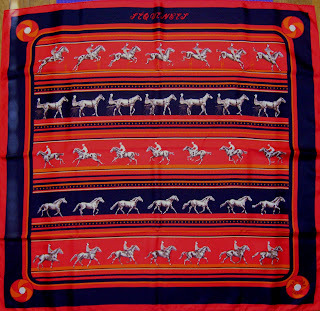 What I do appreciate is that horses are depicted as bear different colours, depending on the background hue - white and brown, in the case of the baby blue background below (which have been paired on the same side of the scarf surface - so that when the scarf is worn knotted, the front corners depict different coloured horses). Wonderfully done ! One final aspect that contributes to the spectacular and elegant scarf: while the design has been launched first as part of the Fall/Winter collection 2008, this reissue is on the famous cashmere and silk mix. Indeed, spectacular ! I recently saw a report on Eadweard J. Muybridge, a pioneer photographer whose story is as fascinating as the invention that his name is most associated with - a technique he developed to capture animal locomotion, out of a popularly-debated question of the day back in 1872: whether all four of a horse's hooves left the ground at the same time during a gallop. 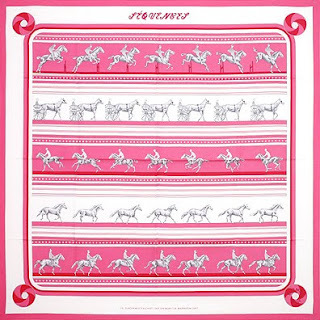 In 1877, Muybridge settled the question with a single photographic negative showing Stanford's racehorse Occident airborne in the midst of a gallop. This negative was lost, but it survives through woodcuts made at the time. By 1878, Muybridge had successfully photographed a horse in fast motion. This series of photos taken in Palo Alto, California, is called "Sallie Gardner at a Gallop" or "The Horse in Motion" and shows that the hooves do all leave the ground — although not with the legs fully extended forward and back, as contemporary illustrators tended to imagine, but rather at the moment when all the hooves are tucked under the horse as it switches from "pulling" with the front legs to "pushing" with the back legs. This scarf design is not particularly beautiful, but memorable for the tribute it pays to a discovery of our modern age. When knotted, the scarf appears quite traditional in both colours and pattern. The white background, however, renders it a classic though. This design is a visible departure from the usual creations of Hermes in that the "canvas" is no longer "clear"; instead, it features a rather heavily - albeit pastel and hence more mutedly so - floral pattern. 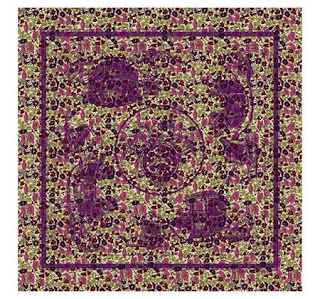 The Maison used one of its previous patterns (hugely successful, the "Ex Libris") to print it on the signature busy floral pattern of Liberty of London. Launched under the banner of "Hermes pops up at Liberty", this scarf design, along with a similas one in fuchsia and pale green, proved highly popular and hence sought-after. 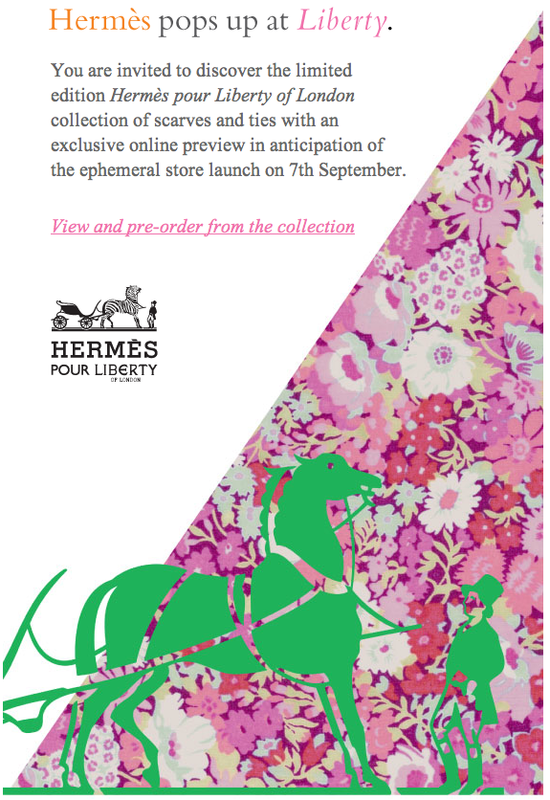 I haven't felt so much enthusiasm admiring the Maison's designs for a while. Yet, like a fabulous find in a treasure chest - literally or figuratively - and I'm thinking here of a pair of shoes on a shelf in a tiny shop down one of those quiet streets in an upscale "quartier" (i.e. 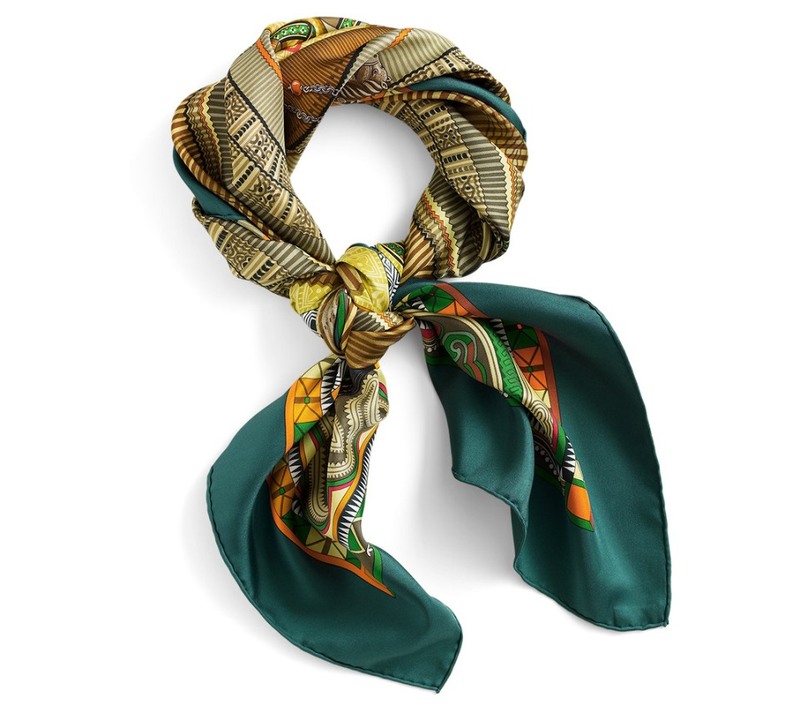 city district) – this scarf has filled my heart with excitement and joy and stimulated my imagination. So a tribute to it is very much in order. Perhaps the design with the most promise of the Fall/Winter 2010 Collection – and one I particularly appreciate – "Cent Plis de Miao" ("A Hundred Pleats of Miao") pays tribute to the Miao culture and its nearly four million-strong people bound by it, living in China (the Miao people also live in Vietnam and Laos, where they’re called “Hmong”). The dress depicted in this design is highly symbolic of the Miao culture and an essential element of it, whose name means “raw rice” – the dress is often mentioned in songs and folk tales, thereby becoming an integral and defining element of the culture. The fabrics are pleated, a technique believed to be inspired from (and reflective of) the mushroom gills. The finer the pleats, the higher the value of the dress. Of particular interest is the creative craft of rendering the colours on the dress: the blue hues are obtained from a natural indigo pigment where the fabric, previously marked with wax to protect the areas (of the design) desired to appear white, is allowed to soak in the indigo dye. 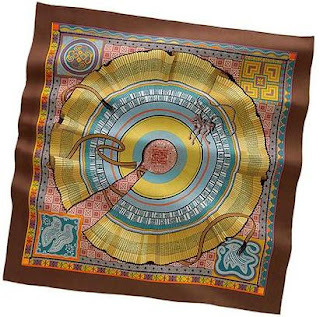 Once the desired hue is obtained, the fabric is remove, allowed to dry, then heated – both to remove the wax and finally to reveal the white patterns. The rest of the colours are embroidered by hand (a fantastic collection, consisting of similar dresses with no less than a thousand pleats is on display at the Musée du Quai Branly in Paris). 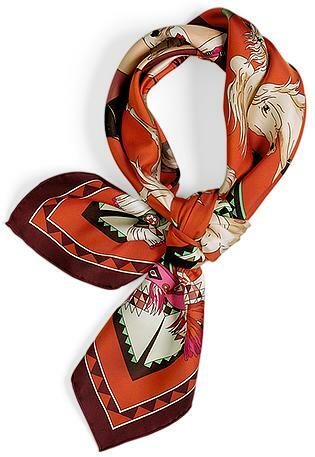 The darling of the aficionados and one of the most prolific designers in the service of Hermès, Aline Honoré has delighted us yet again with a design inspired from far-away lands, equally fascinating and mysterious. She chose to depict the dress in all its splendour, spread across a surface suggestive of another type of fabric design that the Miao women choose to wear tied around their legs, whose patterns of squares and lines are also representative of their culture. Reminiscent of the Brazil design of the previous season’s collection in the dress display, the similarities between the two designs stop here. The background is simple so as to allow the dress to shine. 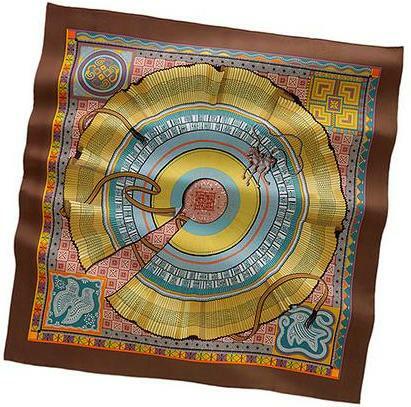 A truly beautiful – artistic, creative, sensible display worth the glory the Hermes silk twill brings to it.